Ready to buy or need support? SeedRight products are available through your local Kinze and John Deere dealers. No dealer in your area yet? No problem give us a call for direct sales and support. Should I use a graphite or talc powder? We recommend and test with an 80/20 talc/graphite mix. Please follow your planter manufacturer’s lubricant rate recommendations and adjust for different environmental conditions as needed. Will I have to adjust the center hub on my John Deere planter? Most likely, with the smaller seed sizes the disc-to-meter distance becomes more critical. 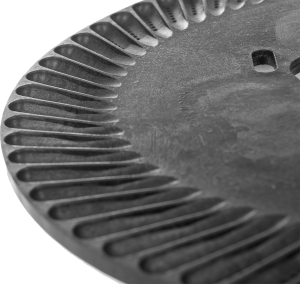 With the SeedRight Large Cell disc it is recommended to adjust the center hub out until the SeedRight Large Cell disc just begins spin freely. 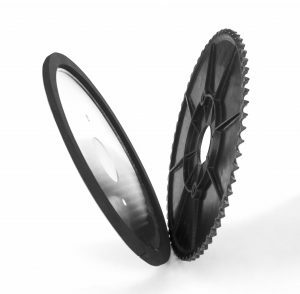 For the SeedRight Small Cell discs it is recommended to remove the double eliminator and adjust the center hub until there is a light friction between the SeedRight Small Cell disc and the meter housing to prevent the seed from escaping. Do I need to remove my double eliminators? For John Deere planters the removal of the double eliminator is not required for the SeedRight Large Cell disc. Adjust the center hub to allow the SeedRight Large Cell disc to spin freely. It is recommended to remove the double eliminator when using the SeedRight Small Cell disc due to the light friction required between the SeedRight Small Cell Disc and the meter housing. For the Kinze EdgeVac meters simply set the double eliminator brush to the zero setting. What meter vacuum do I need to maintain? For both the John Deere and Kinze EdgeVac meters 6-8 inches of water provide consistently accurate rates. In some situations with rougher field conditions, higher vacuum settings may be required to deliver consistent rates. Can I plant cover crop mixes with the SeedRight discs? Yes, but careful consideration must be given such that only contains seed sizes that fall within the recommended seed size of the SeedRight disc. Will John Deere CCS Planters work with SeedRight Discs? Yes, tank pressure is commonly ran from 8-10 inches of water. What if I have hydraulic or electric drive meters? We can do that too! You will choose an OEM disc (Ex: ProMax 40, High Rate Soybean…) from your monitor menu and then follow the SeedRight rate chart to find your corresponding small grain planting rate. Can I send in a seed sample for testing? Absolutely, we are constantly looking to expand our list of endorsed seeds. If you have a seed you would like to have tested please contact us directly. Will SeedRight design and build custom solutions for specialty seed? Yes, we understand the specialty market has very specific needs. Our team will work with you directly to make sure your planting needs are accommodated. How do I install my BackerPlates? The backer plates are designed to assembled after or behind your OEM plates, with the foam side facing the OEM plate. The BackerPlate functions as a “self adjusting” seal to retain the smaller seed in the meter during planting. There is no need to use a tool to tighten the backer plates to the meter, hand tightening will provide enough clamping force to seal the meter.